We can show you, using real examples, which additional costs can be incurred when installing a charging station, regardless of the environmental situation. Thomas lives with his family in a detached house with its own garage. In one month, his brand-new Tesla Model S with double charger is arriving. In The Mobility House’s online shop, Thomas has already found a KEBA charging station with a 4 m cable and 22 kW charging power (price: € 999.00). He also orders the installation service (price: € 279.00) in order to have his electrical set-up assessed and the charging station for his Tesla installed. Two days later, an appointment has already been agreed and two weeks later a qualified electrician comes to Thomas’ house. Previously, only a power supply for lighting and two domestic sockets in Thomas’ garage were available. This is not enough to charge the Tesla quickly. 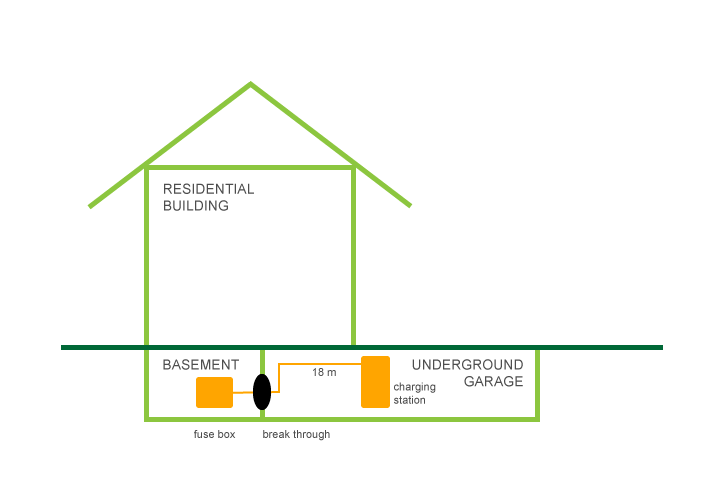 For the 22 kW connection of the KEBA charging station, 18 m of cabling from the fuse box in the house to the garage had to be installed. Here, it was necessary to break through a wall. 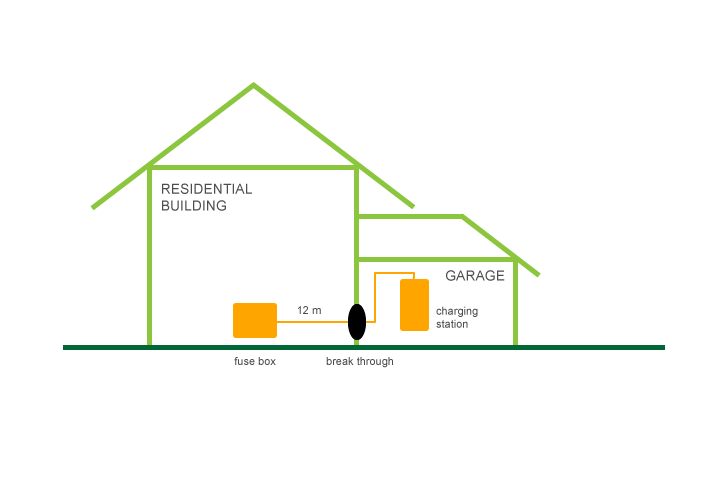 In addition, the electrician must install those safety features required by the standards, and obtain permission from the network operator since the home charging station exceeds a load capacity of 12 kW. Firstly, the electrician provides Thomas with a detailed proposal for the additional services described (see proposal table). Thomas then confirms that he wishes the installation to be carried out in this manner. Due to the necessary additional works, the installation has to be performed at a second appointment. The installation is carried out without any hitches. At the end, everything has been installed and all traces of a handyman ever being there have of course been removed. The electrician then turns on the charging station for the Tesla and tests the functions and checks the measurement values. Finally, he shows Thomas how to charge his Model S with the new charging station. The parking space and the walls of the garage are deemed communal property. Therefore, Daniel needed the approval of the community of owners before making constructional changes. In order to agree the installation with the community of owners, he first contacted the building administrator by e-mail and requested more information on the approval process. Anna from the house administration places his application on the agenda of the next community of owners meeting where the installation of the charging station will be voted on. She also asks Daniel to attend to community of owners meeting in case of questions. Daniel speaks with certain tenants in advance who are also owners in order to gather a few questions. Now Daniel knows the thoughts of his fellow tenants with regards to charging power costs and the safety of electric cars and can prepare himself as best possible for the community of owners meeting. How does the invoicing of power consumed work? In order to ensure that the power used by the electric car is charged to Daniel, an individual power meter is installed. This means that no costs will arise for the other tenants. Is the charging of an electric car at a charging station safe? A charging station corresponds to a multiple-fuse “socket” which was developed especially for charging electric cars and fulfils all safety criteria. Unlike a normal socket, the charging station for electric cars has no live parts, provided no electric car is connected. Even if a wire or screwdriver comes into contact, nothing will happen. The sockets on the charging station are only suitable for electric cars and cannot be used to connect any other device. The electric car is monitored electronically during the entire charging process. In case of disruptions or warnings, the charging process is immediately terminated. Experts from TÜV Süd, DEKRA and the Allianz Zentrum für Technik confirm that electric cars are at least as safe as cars with combustion engines. If the damage is caused by faulty installation, the certified electrician will be liable. If the damage is caused by the electric car of the charging station, the corresponding manufacturer will be liable. If Daniel fails to use the charging station correctly, he will be liable. For this, he checks his insurance policy in advance and makes sure that he is appropriately covered. Daniel does not have to spend long explaining to his landlord that the installation of the charging station for an electric car will be of benefit not just for the parking space but the property as a whole. Electric mobility is becoming ever more accepted by the general public and politicians alike. Notable car manufacturers are significantly expanding their selection of electric models which will lead to an increased demand for charging stations in the future. Current and future tenants will demand this more and more frequently. What happens to the charging station if Daniel moves out? If Daniel moves out, the charging station can be fully uninstalled. The charging station can be removed by a certified electrician with ease and the cabling can also be removed if requested. However, it is significantly easier to cover the connections with a blind socket. In the approval agreement, Daniel has pointed out that, should he move out, the charging station must be removed but not the cables. Once the installation has been approved without issue, Daniel can concentrate on the charging station and its installation. Anna then informs Daniel that the installation of the charging station for the electric car may only be carried out by a qualified electrician. He therefore orders the appropriate charging station – the ABL charging station with 5 m cable and 22 kW capacity – and the corresponding installation service for his smart from The Mobility House’s online shop. Daniel receives a phone call from an electrician two days later and agrees an appointment with him. One week later, the electrician comes by, checks the electrical set-up and explains to Daniel exactly which additional works are necessary. The charging station is connected to Daniel’s existing power supply/power meter in the basement of the block of flats. Since the charging power exceeds 12 kW, an Type A RCD EV with DC fault current detection is necessary, and in addition approval must be obtained from the network operator. Between the parking space and power meter there is a fire door, meaning breaking through the wall is subject to strict guidelines. Subsequently, 25 m of cabling is laid, wherein half the cable can be laid with “exposed wire” and half with existing cable racks. The electrician writes up a corresponding proposal (see table). The charging station is installed and Daniel is thrilled. His neighbours have even asked him about his experiences and want to follow his example. One has already submitted an application for a charging station for his parking space to the building administration. Franz lives in a semi-detached house in Garching, Munich with his wife. In future, he would like to drive to work in an electric car and orders a Renault Zoe. This is to be parked and charged in the built-in garage. Franz read some information about charging his ZOE at home on the internet and decided to seek the advice of The Mobility House. He calls the Service Center and is forwarded to Michael, one of TMH’s experts. Franz briefly outlines his situation. At the time the house was built, he had already been thinking that in future he might drive an electric car and would like to equip his garage with a 22 kW industrial socket. After a few minutes, Franz knows exactly what he needs. When choosing the right charging station for his Renault ZOE, Franz must ensure that this is ZE READY certified. Three days later Franz orders a KEBA charging station with 22 kW capacity and socket. 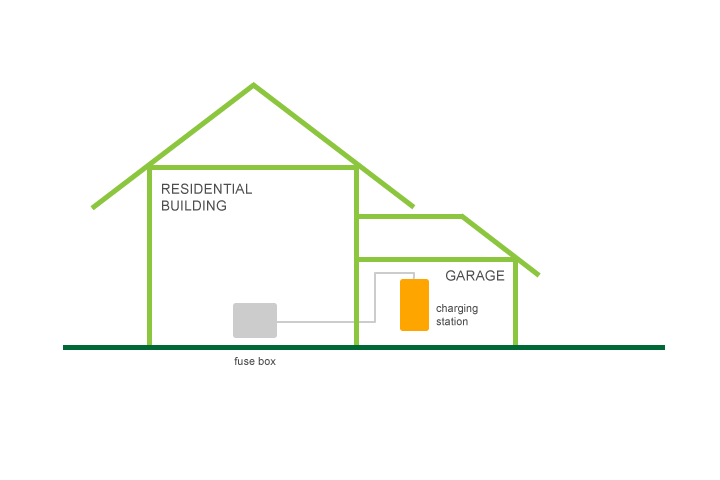 He would like to be able to connect various electric cars flexibly and also to offer his electric car-loving friends the opportunity to charge their cars at his house. The Renault ZOE has a type 2 socket. If Thomas’ friend Peter comes by with his Nissan Leaf, he will need a power cable with a type 1 connection. Even though Peter’s Nissan Leaf can only charge with 3.3 kW, he can still connect this to the 22 kW charging station. In order to have the charging station correctly installed, Franz orders the installation service. The day after next, he is called by a qualified electrician who agrees an appointment with him. The cable already laid can be used by the electrician without issue. The red CCE socket is simply replaced by the KEBA charging station (22 kW) for the Renault ZOE and an RCD type A with DC fault current detection must simply be installed. Thanks be to bureaucracy – the electrician compiles a short proposal for the RCD (see proposal table). The installation of the charging station including installation of the RCD type A with DC fault current detection is complete after just 2 hours. Franz is then instructed on how to operate his new KEBA charging station. Now he can scarcely wait until his Renault ZOE is delivered in the next few days and he can rely solely on electricity on his way to work. He now has a proper power supply for his new car.